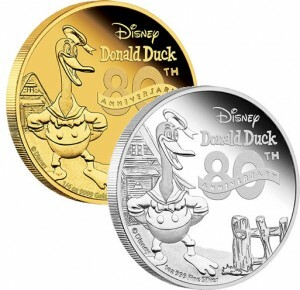 The Perth Mint of Australia has unveiled the second issues of its two year programs featuring classic Disney characters with new strikes honoring the 80th anniversary of the beloved bird Donald Duck. Now available from the Perth Mint are the Disney – 80th Anniversary of Donald Duck 2014 1/4oz Gold Proof Coin and the Disney – 80th Anniversary of Donald Duck 2014 1oz Silver Proof Coin. Each features a classic image of Donald Duck taken from his debut appearance eighty years ago in The Wise Little Hen. "The Perth Mint is thrilled to celebrate Donald Fauntleroy Duck, one of the most beloved Disney characters who first appeared in The Wise Little Hen, released in 1934," offers the Perth Mint on its website. "Throughout the following decades, Donald was nominated for seven ACADEMY AWARDS®, winning an OSCAR® statuette in 1943. Donald’s partner Daisy, his uncle Scrooge McDuck, and his three nephews Huey, Dewey, & Louie, often feature in cartoons alongside him." The gold and silver coins follow the inaugural Disney program strikes which depicted Mickey Mouse. Additional coins of the programs will be released in intervals for two years. Each Donald Duck Gold Coin is composed of one-quarter ounce of 99.99% pure gold. The silver issue is featured in one ounce of 99.9% pure silver. Both are struck to proof quality as legal tender of the island nation of Niue. The officially licensed products are issued by the New Zealand Mint. Mintage for the coins are extremely limited and are expected to sell out quickly. Just 1,000 of the gold coins will be sold with no more than 10,000 of the silver Donald Duck pieces available. Current pricing is shown as AUS $704.55 for the gold coin and AUS $102.27 for the silver. This pricing is subject to change.